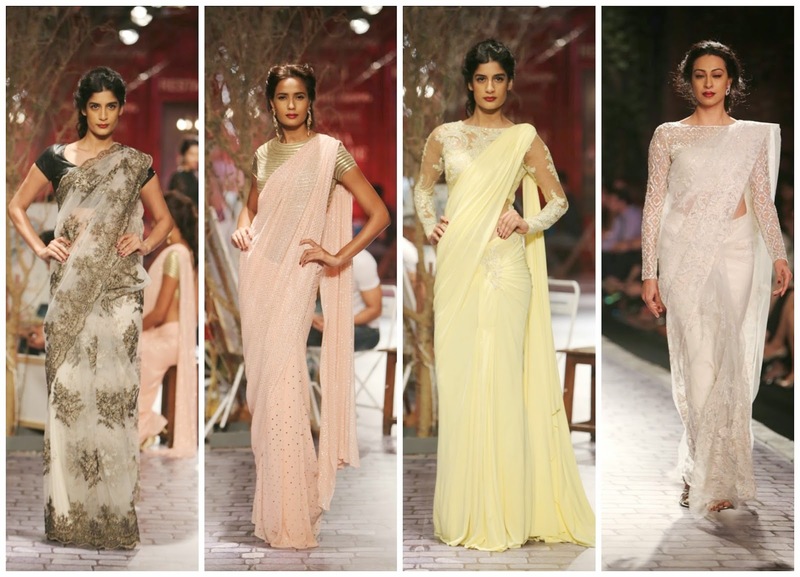 Monisha Jaising's World Bride - India Couture Week 2014 | The Shopaholic Diaries - Indian Fashion, Shopping and Lifestyle Blog ! I am back with more updates from the recently held India Couture Week 2014 presented by Shree Raj Mahal Jewellers. 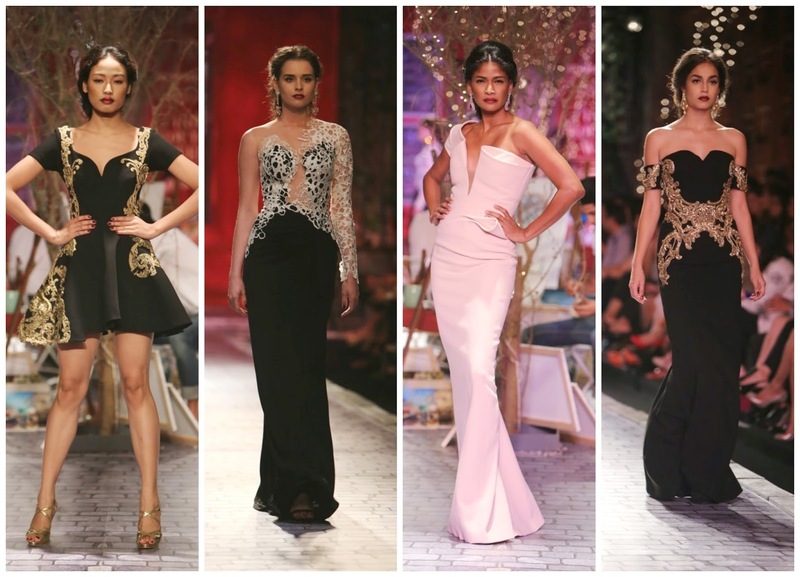 In this post I will be covering the exquisite designs presented by one of my favorite designers Monisha Jaising with her collection World Bride with the setup of a Paris street. World Bride takes its influence from the City Palace, Jaipur, which includes the Chandra Mahal and Mubarak Mahal palaces and other buildings. The palace complex incorporates an impressive and vast array of courtyards, gardens and buildings, which has been captured in the form of imagery and intricate embroidery in Jaisingh's collection. The models sashayed down the ramp to showcase the 'World Bride' range, inspired by the lifestyles of the high-borne from the past. 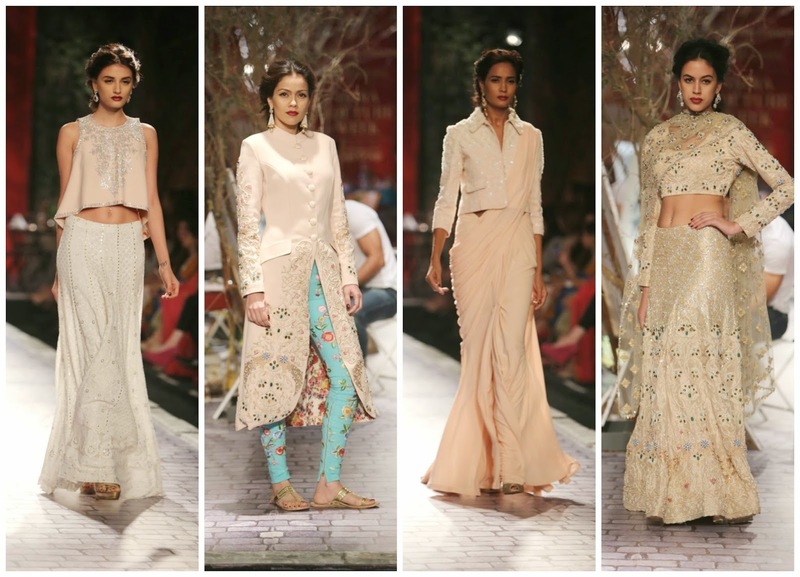 The collection's inspiration is a fusion of Indian, Mughal and European styles of monarchy architecture and lifestyle. Aimed at modern, confident and edgy brides, the pieces captured the drama of the 18th Century, especially the Rococo style known for its splendor, grandeur and luxury. 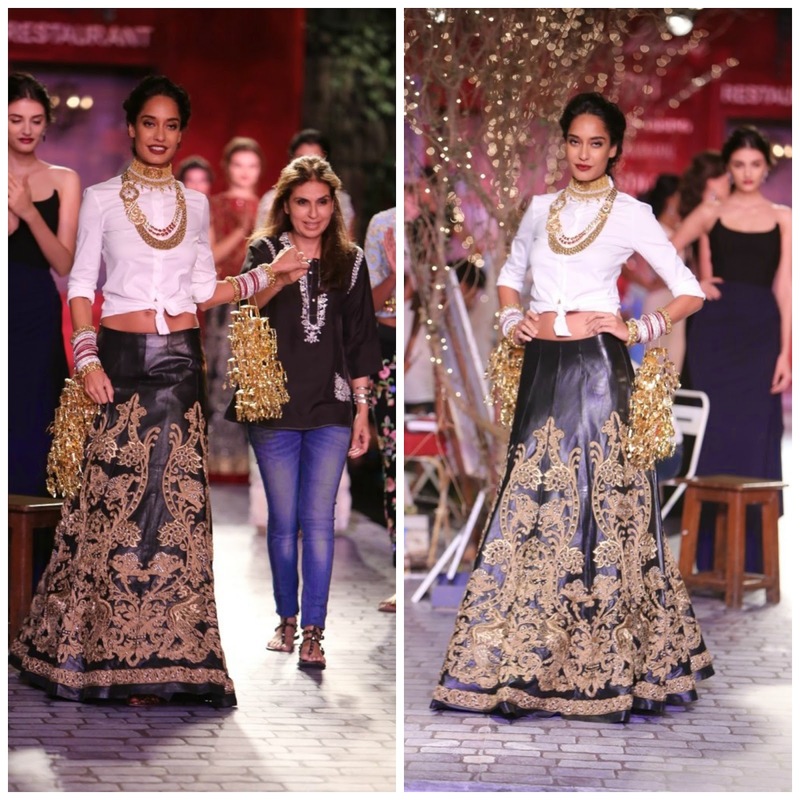 Monisha Jaising paired her bridal ensembles with elaborate ethnic gold jewellery from Shree Raj Mahal Jewellers on DAY 3 of the Shree Raj Mahal Jewellers India Couture Week 2014. The showstopper for Monisha Jaising was none other than Model & Actress Lisa Haydon whose strong stage presence was accentuated by Jaisingh's heavily embroidered leather lehenga, which she teamed with a white knotted top to give it a modern twist. What made the showstopper look stand out was the traditional 'chooda' and 'kalire' worn by most of the Sikh and Punjabi brides. Neutral colours such as ivory, ebony, silver, gold and denim blue; sorbet colours such as mint green, ice blue, banana yellow, pale pink, whiskey creme; earthy tones such as olive green, brick red and burnt umber, tangerine; jewel tones such as emerald green, ruby, topaz, and turquoise; and monotones such as black and white have been used for the line. I will be sharing more updates from the ICW 2014 in the coming days. Stay tuned! Oh gosh, those dresses are amazing ! How I wish I can own them all.. Cool collection! Please participate in Giggles Accessories giveaway on my blog. Loved her modern take on the classic Indian dressing...just the leather lehnga didn't appeal much to me! 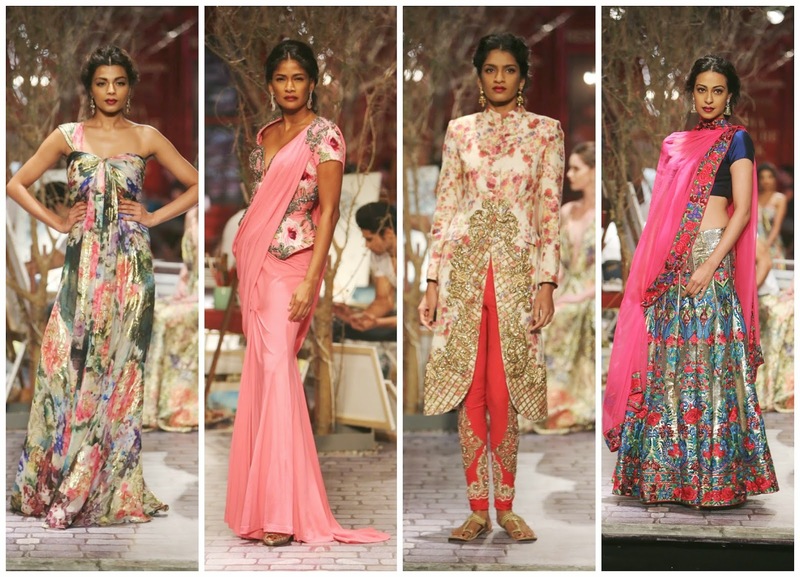 Monisha Jaising has studied Art and Fashion from some of the best Art Schools in London. She launched her label through the multi brand retails store, Ensemble in around 1990. Today, she is one of the most established Fashion Designers in the country. She is credited with re-inventing the Kurti and Indian woman's wardrobe staple. Her designs are inspired by India and her travels to exotic places.